Art is about being stirred – identifying creatively with an idea and responding to something which is there to engage us. Modupeola Fadugba’s exhibition “Dreams from the Deep End” is a body of work which both captivates visually and completely absorbs from a topical perspective. Currently on display at Gallery 1957 in Accra, we were lucky enough to be there for the opening, which coincided with the 2018 Chale Wote Street Art Festival in Accra’s Jamestown. Aside from the work itself, Fadugba’s personal story is a compelling one. Born in Lomé to UN diplomat parents, she grew up in the United States and Rwanda, is Harvard-educated, and has a background in economics and engineering. She is a relative newcomer to the art world (2014). However, an all-consuming desire to paint led her to the self-belief that being an artist could become her reality. The theme of water is something which appears repeatedly in Fadugba’s work and has played an important role in her personal development. She recalls, as a child, being fearful of the ocean and learning to overcome this through swimming classes. Back in Nigeria, as an adult, she describes the same notion of fear at a swimming pool where her brother was about to dive from the highest platform. Plunging into the water to the applause of family members also symbolized the high dive head first into a new career as an artist. “Dreams from the Deep End” takes us to New York and the summer residency Fadugba spent with the Harlem Honeys & Bears - the city’s only all-black, synchronised swimming team for senior citizens. 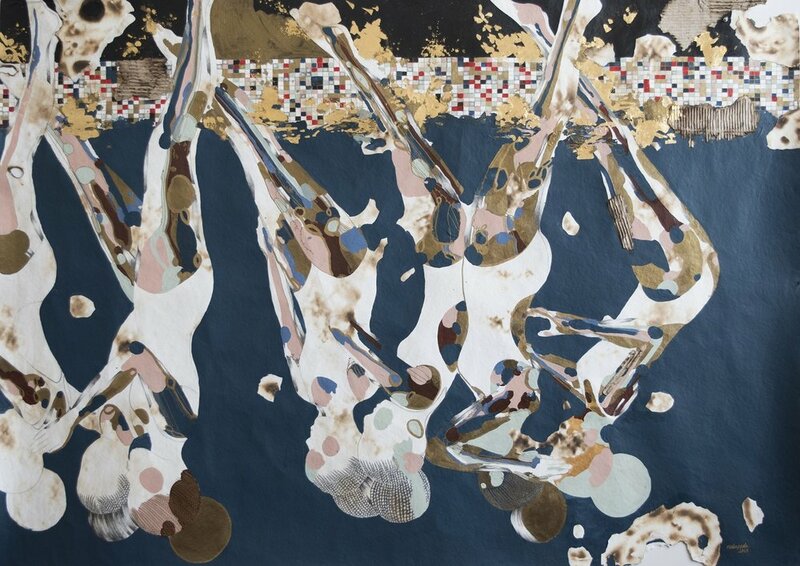 Curated by Katherine Finerty, the result is a multi-media exhibition incorporating painting, drawing and installation, with a look at identity, social justice and cultural hierarchy. It’s an exquisite body of work displayed in a mellow space of walls painted blue, videos shown in portholes, paintings infused with gold-leaf and the burn marks which she later connects back to impressions of the ravaged buildings she saw in war-torn Rwanda as a child. Her research covers Jeff Wiltse’s “Contested Waters: A Social History of Swimming Pools” and looks at historical racial segregation in America’s communal swimming pools. Harlem is synonymous with renaissance and reconstruction and indeed this is a story of rebirth. Historically, the black community would not have had access to swimming pools and neither the opportunity to learn to swim, so there is a lot of power in this narrative and what it signifies. The accompanying short film documents Fadugba’s time spent with the Harlem Honeys & Bears and beautifully takes us into their world for a mere glimpse. It really brings to life the body of work as she tells a story of empowerment and resilience, fight or flight, and how to dream from the deep end.